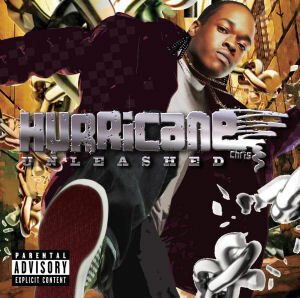 RapReviews.com Feature for January 12, 2010 - Hurricane Chris' "Unleashed"
Hurricane Chris can lay claim to being one of the most successful digital artists of the 21st century, with his hit single "A Bay Bay" being downloaded over 3.5 million times as a song or ringtone. Commercial success not being equivalent to artistic merit, our writer Justin 'Tha Shiznute' Chandler found his debut album "51/50 Ratchet" to be more than a little bit underwhelming. That being said the amount of focus and determination Chris shows as a young artist in a crowded marketplace and his willingness to embrace new media distribution make him a hip-hop entrepreneur to watch, and Adam Bernard's interview shows we haven't stopped paying attention. To that end we present "Unleashed," released late in December '09 but packed with plenty of potential to pop in 2010 off the strength of the Play N Skillz produced lead single "Halle Berry (She's Fine)." And I'm fin' ta hit her backwards, have her slidin off the mattress"
There are at least four things Hurricane Chris has going for him on "Halle Berry" - a catchy and memorable chorus, a charismatic delivery reminiscent of Lil Wayne, descriptive lyrics that paint a very visual picture, and a simple beat with strong drums perfect for the club. Unlike many similar Southern songs, "Halle Berry" is deliberately slow without being deliberately screwed, making it very easy to picture the fine woman Chris describes moving her booty in slow motion. Of course you don't even have to imagine it - you can watch the video on YouTube HERE and as of this writing the video has been viewed over 600K times since last April. If Chris' online popularity continues to hold then The Inkredibles produced "Headboard" should do equally well. You can accuse Chris of being a one trick pony when it comes to his sexual raps, but he and guests Mario & Plies do that one trick quite well. All the way to the mornin, promise I go the hardest"
What'chu want in yo' stomach, a girl or a boy? How you want me to start, the tongue or the toy? Call her Duncan Hines cause she is so moist"
Well that's unapologetically explicit - Luther Campbell ain't got nothing on Chris and Plies! Even knowing that this is the second single, I still had to watch the video online to see/hear just how much of this got censored out - and it wasn't nearly as much as I expected. Since Chris has got a theme and subject that works well for him, it's no surprise to find that what's really being "Unleashed" on his sophomore album is his sexual libido. The Mouse produced "Coke Bottle" is about his favorite shape for a woman to have, the Don Vito laced "Secret Lover" featuring Cherish is about exactly what the title implies, and the Phunk Dawg crunk bounce of "Beat it Out the Frame" is bragging about his prowess being louder than average: "make so much noise, they gon' hear us in the living room." Not every rapper could get away with being this singularly focused in his topic matter, but Chris is possessed with a clarity of diction that's above average among his compatriots, making his energetic delivery very easy to listen to and digest. Production from the likes of Shawty Redd, Rodnae and Raphael RJ2 certainly helps too, along with guest appearances like Bobby V on "Last Call" and Beenie Man on "No Worries." To make a long story short, Hurricane Chris built on the strengths of "51/50 Ratchet" and did not repeat his previous mistakes, thus improving musically and lyrically as an artist. So long as Chris continues to evolve from album to album, he's only going to get better and more interesting in the years to come.